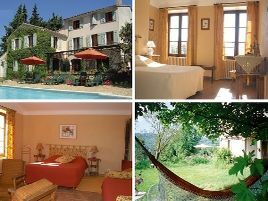 La Bastide de Messine is an old, spacious provençal bastide dating from 1850, completely renovated, situated within eight acres of grounds on the Cante-Perdrix hill. Panoramic views of the Celles hills, the Loube mountain and the village of Brignoles. Swimming pool. This is a comfortable and cosy house, making for a very pleasant stay. The attractive rooms are spacious and tastefully decorated. Breakfast with Nelly's homemade jams. Summer kitchen at guests' disposal. A warm and cheerful welcome..
- massages Bien-Etre. - golf de Barbaroux à 8 km. 5 rooms with bath or shower and WC. From 70 to 115 euros (2 pers.). Extra bed 30 euros. The closest station is Aix TGV, located at 50 km. The closest airport is Nice ou Marseille, to 100 km.